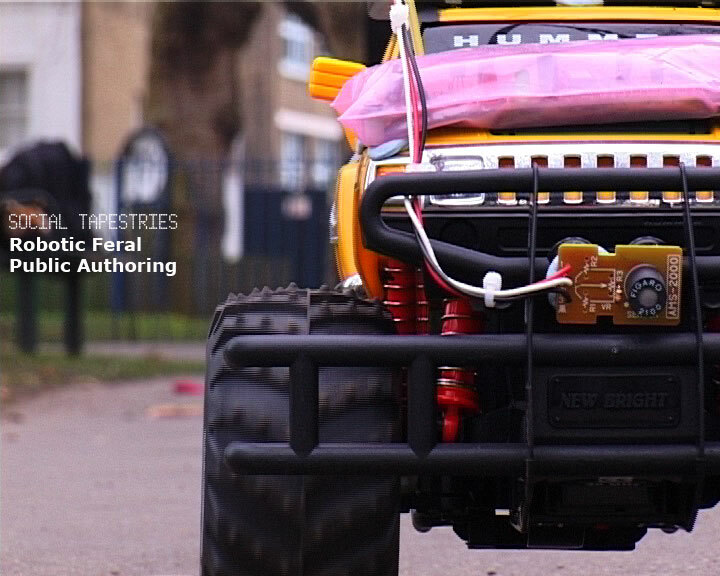 Robotic Feral Public Authoring was a collaboration between Proboscis, Birkbeck College’s Pervasive Computing Lab and Natalie Jeremijenko. Combining Proboscis’ Urban Tapestries public authoring platform with Natalie’s Feral Robot concept (first commissioned by Proboscis for Private Reveries, Public Spaces) to create a pollution sensing and mapping tool for local communities to discover more about their environments and correlate it with other local knowledge. Working with local residents and users of London Fields in Hackney we built a feral robot to sense air pollution in the park, uploading the data via Mesh WiFi to the Urban Tapestries platform where it could be seen mapped against local knowledge about the park shared by residents. Space Media Arts provided a base for a bodystorming workshop and access to a local mesh wifi network. Team: Demetrios Airantzis, Alice Angus, Camilla Brueton, Dima Diall, Natalie Jeremijenko, Giles Lane, Karen Martin, George Papamarkos, George Roussos & Orlagh Woods. Partners: Birkbeck College (University of London), Space Media Arts.